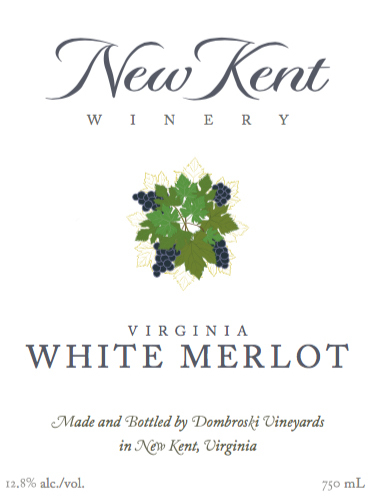 Our White Merlot is a white wine created from the red Merlot grape. Its red wine mouth-feel and delicate sweetness allows it to pair well with spicy foods. I like the taste of a Merlot but red wine doesn't agree with me. I always wondered if there could be a white Merlot. I was so delighted when I attended a wine tasting at the winery and they served the White Merlot. Great to hear that this wine is winning awards--it should! From Anonymous of Charlottesville, Virginia on 10/19/2017 . I am so glad a friend took me for a tasting! This White Merlot is the best, hands best! I became a Wine Club member because of THIS wine!!!!!!!!!!! From Carla Bourgeois of Venice, Florida on 8/25/2017 . The only thing we miss since we moved from Virginia. Glad we can at least have it delivered down here. From Cathy Cockrell of Roanoke, Virginia on 12/30/2016 . I did not know white merlot existed until I had this wine. I searched for it in local sections of grocery stores and wine stores and was excited to find out New Kent shipped. My order was here in 3 days!